While this post might be labeled “Workbench”, it’s not, really. 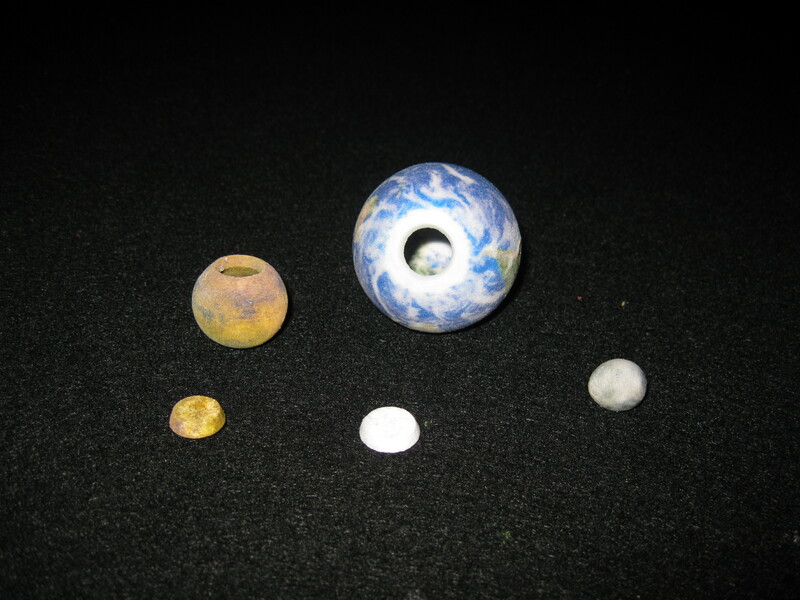 The planets you’re looking at above are how I received them from Shapeways. These models were created by jayfisher (Jay Fisher?) 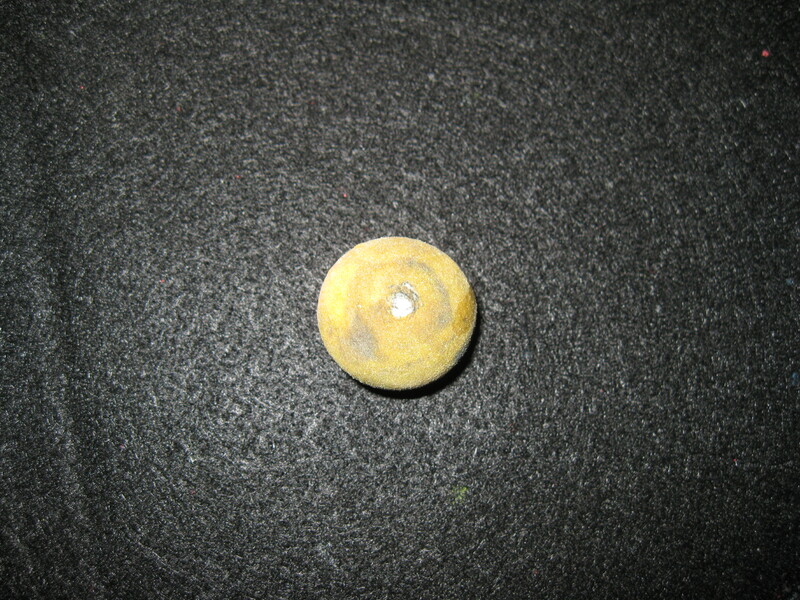 from data provided by NASA, and printed in colored sandstone. They’re available here. Before I get too far, let me emphasize that there will be two parts to this review. 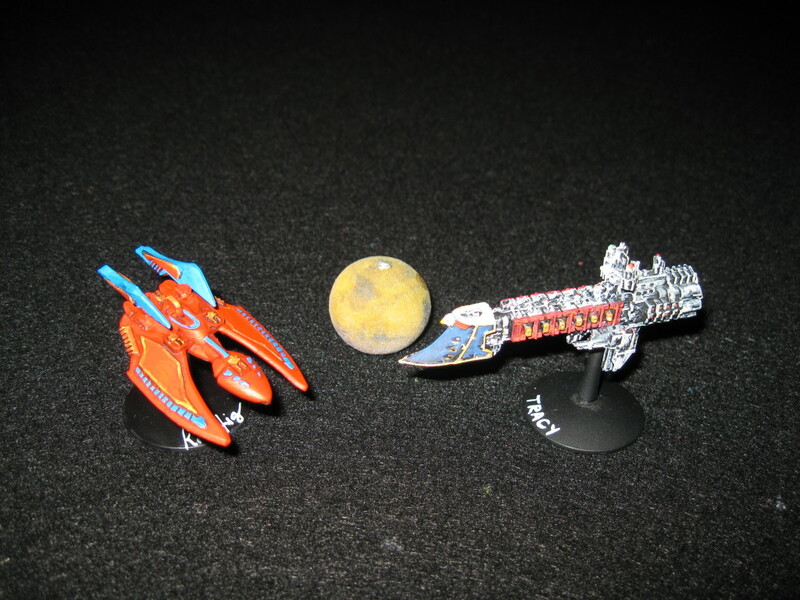 One part (more important to me) is how well the models work in a miniatures game. The other part is the quality part — that is, how well the models were rendered by the 3d printing process, and how accurate they are. As usual, clicking on a photo will bring up the full-size version. The plugs go in these holes. The disks you see in the pictures are actually plugs that go in the south poles of Earth and Mars. Generally speaking, hollow forms are cheaper to print, and this is one of the solutions. I’m not planning to use the plugs, as leaving them out allows me to place the models on the tabletop without worrying that they’re going to roll. The Moon is not hollow, presumably because it’s about the size of one of the disks. 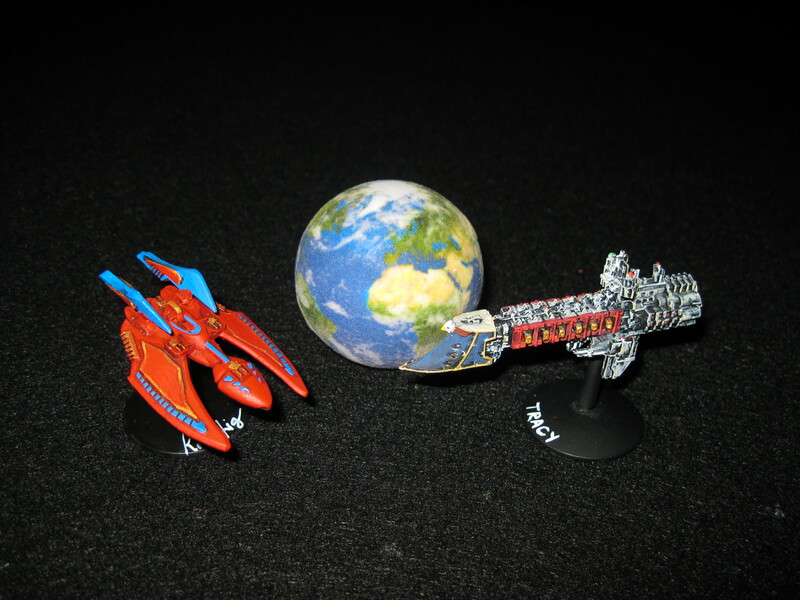 Here’s the Earth next to a Karria (a Cold Navy destroyer) and a Dauntless (a BFG light cruiser). 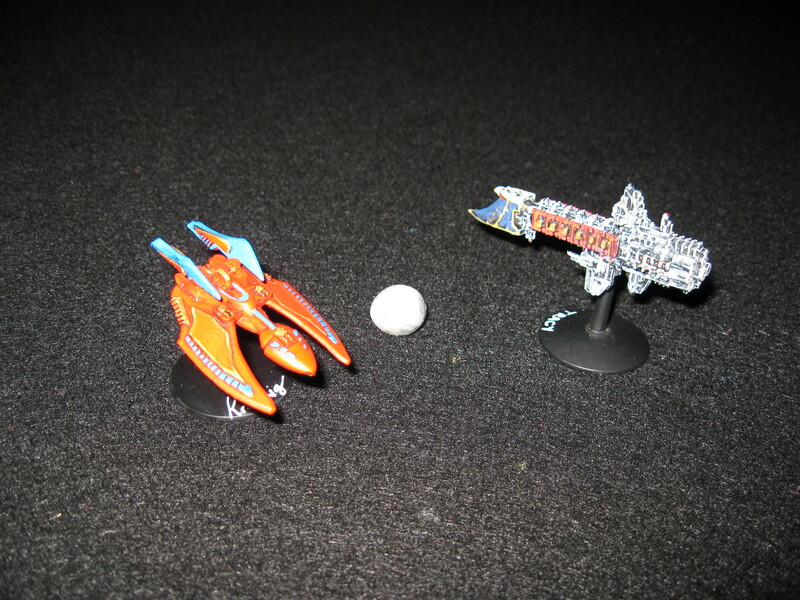 While Starships uses the post of the miniature as its actual location, it’s nice to see a planet hold its own visually. The Earth does. Mars doesn’t have the same mass, and comes in duller colors than the Earth. These destroyer-sized ships dominate Mars visually. And the Moon? 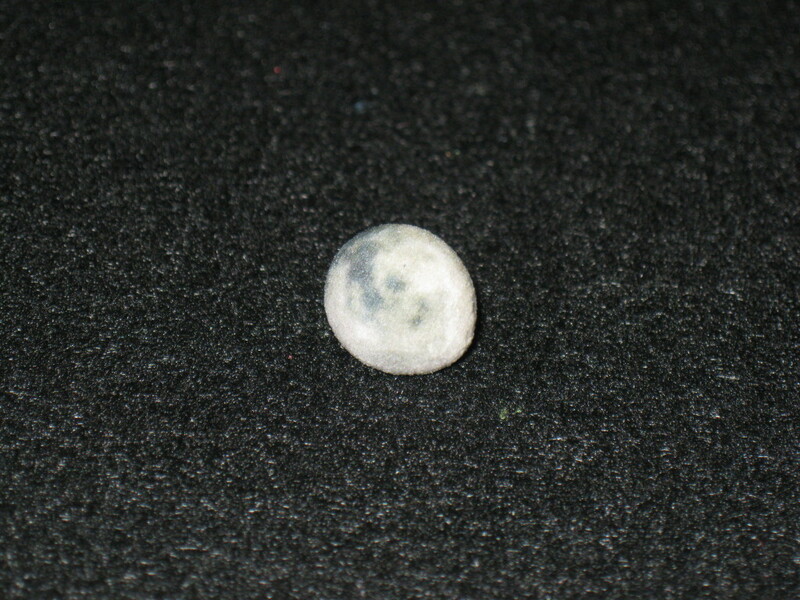 It’s just a pebble. It has no heft, rolls around on the table, and is dull. Honestly, it’s what you’d expect when you compare it to the Earth, but it’s not really something you want to place on your gaming table. 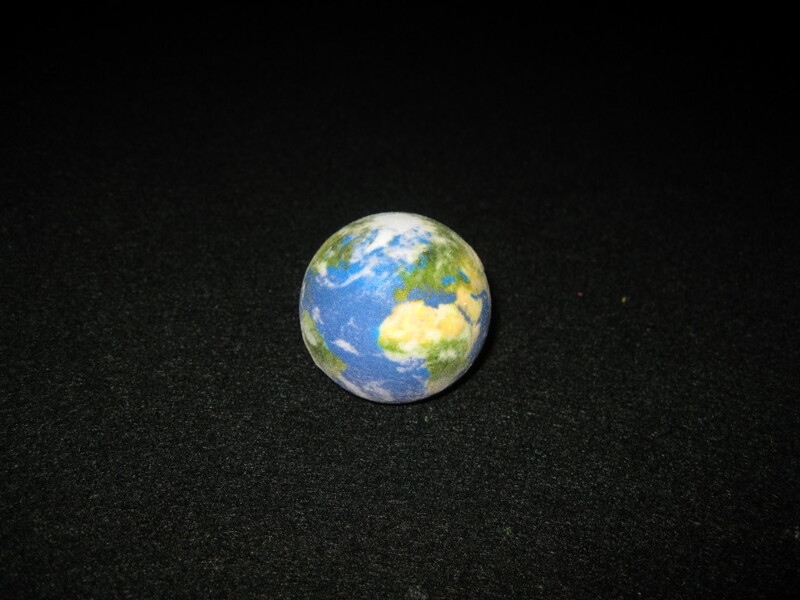 As for the print quality, the Earth came out very nicely. The land masses are recognizable, and the planet is spherical. You can also feel the contours of the Himalayas and the Andes. The texture of the sandstone takes a little getting used to, but it doesn’t feel particularly fragile. In fact, what Shapeways means by “delicate feel” in their description of the material is that you feel like you’re brushing sand off of the model during the entire time you’re handling it. I’ve seen no sand actually fall off, so this is entirely a handling issue, and not a robustness one. Also, there are glittery flecks in the sandstone. They go well with the Earth, as so much of the planet is reflective. I’m less satisfied with Mars. If you look closely at the right-hand side of Mars in the photo, you can see what looks to be a wet streak. That’s part of the model. Also, for some reason, Mars shows more evidence of the printing process than the Earth. You can find the tell-tale rings produced by the additive process on both models, but the Earth’s are only truly visible if you’re looking at the South Pole, and the light has to catch it just right. Mars’ can be spotted easily. The model is also not smoothly spherical. Given where the flat spot is on the model, it’s possible it’s the hemispheric dichotomy that the real Mars exhibits. The reason why I took a picture of the Moon from this odd angle is that I wanted to show off how the model is shaped like an egg. The Moon does have a tidal bulge, but it’s only 20 inches high, so I don’t think this is intentional. Not visible in this photo is a bit of flash located about where Aristarchus Crater is supposed to be. While I agree with the idea of printing these objects to scale, I’m thinking the Moon managed to push past the limits of what 3d printing with sandstone can consistently accomplish. Note that there are at least three colors involved, which makes me think that the egg shape is due to uneven cooling. It’s just supposition; I have no proof. In the end, this is the first remotely negative review I’ve written, which is too bad. If you could get the Earth on its own, I’d give it a 4/5 (about as high as I can, given the additive printing artifacts), and recommend it for gaming. Mars is only adequate for gaming (3/5), and the Moon is unusable. How you combine these ratings is dependent on your objectives: if you’re planning to use all three, then the rating is very low. 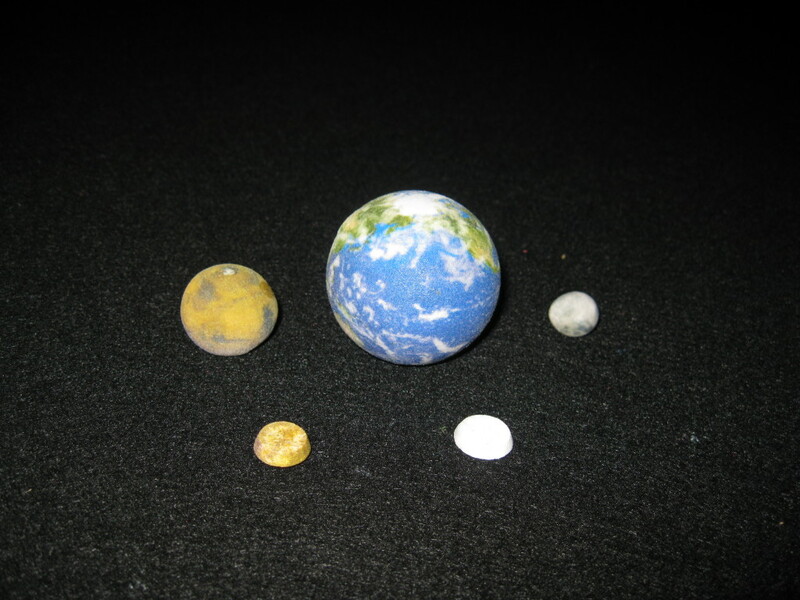 Since the Earth model is the only 2″ sandstone model of it on Shapeways, you might want the set just for Earth. If that is true, or if you will settle for the Earth and Mars, but no useful Moon, then the set rates a 3/5. This entry was posted in third party and tagged bfg, cold navy, Shapeways, workbench. Bookmark the permalink.